Silke Asbeck, managing director of the Historische Stadthalle Wuppertal accepted the “Town Marketing Prize 2018” at the awards ceremony of the Wuppertaler Wirtschaftspreis for economic enterprise in Wuppertal. Every year, the award is presented to companies, private individuals, associations and organisations who have contributed to improving Wuppertal’s image both in the town and beyond its borders and who have also raised its public profile. Visit the Historische Stadthalle online or experience a spectacular new guided tour through the entire building thanks to virtual-reality glasses and your mobile phone. Green is the new black for the events industry and at Historische Stadthalle Wuppertal! Green is the new black for the events industry and none more so than at Historische Stadthalle Wuppertal where they have been recognised for their environmental and economic savings - 94.3 tons CO2 and €28,100 per year. The 10th round of ÖKOPROFIT for the three cities in the Bergisches Land (Bergisches Städtedreieck) reached its conclusion with a festive award ceremony in the Historische Stadthalle Wuppertal on 22 June. 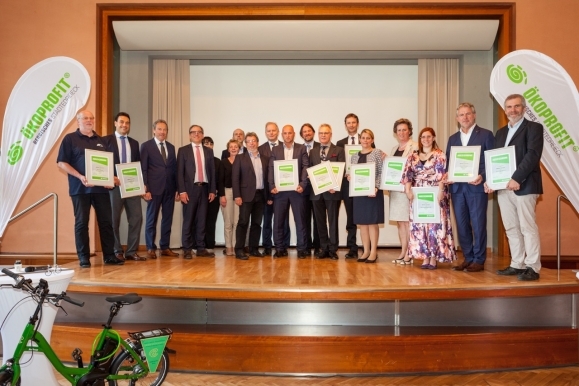 A total of 11 companies from Wuppertal, Solingen and Remscheid won awards for their outstanding contribution to environmental protection. Numerous political VIPs were among the 70 invited guests. The Historische Stadthalle Wuppertal is located in an impressive building, completed in 1900. This historic conference centre for 2000 guests is one of the city’s landmarks and stands on a green hill overlooking the town.